Are you after that perfect lawn? We all want a nice lawn we can enjoy all year round but are just too busy with work and family or simply lack the knowledge. Our lawn care services come highly recommended. 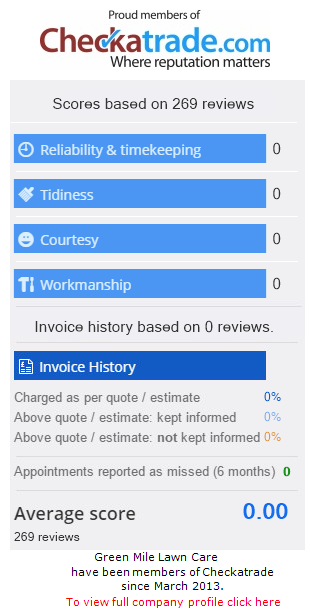 Just check out our Checkatrade page where we score an average of 9.8 out of 10. As an independant lawn care company we can give your lawn the individual attention it needs and you get the lawn looking amazing. Green Mile Lawn Care operators are fully qualified to spray pesticides. Each operator holds the NPTC licence to allow them to spray pesticides. We are also fully insured. Based in Aldershot Hampshire, Green Mile Lawn Care offers lawn treatments in and around the Aldershot area. We provide lawn care services to homes and businesses across Hampshire, Surrey and Berkshire. An increasing number of home owners want a great looking lawn, but either don’t know how to achieve it or don’t have time available to spend on improving its condition. Off- the-shelf lawn care products are generally inferior to professional products, and therefore the results are often disappointing. Green Mile Lawn Care is your local lawn care specialist. Call on our lawn care expertise and knowledge and let us achieve the results you want – an amazing looking lawn. We work with leading lawn care product manufacturers to incorporate the latest ideas and techniques in our lawn care service. The products we use are more effective and longer lasting than most garden centre products. We also apply the lawn care products your lawn needs at a lower cost than you could do it yourself, saving you time and money. Many of the products we use are not available to the public or most general gardeners. We have the a range of lawn care treatments and packages that are guaranteed to improve the condition of your lawn. Investing in an ongoing lawn treatment care package is the best way to make sure your lawn gets all the nutrients and care it needs to look great all year round. Error: Error validating access token: Session has expired on Monday, 01-Apr-19 12:00:47 PDT. The current time is Saturday, 20-Apr-19 01:13:41 PDT.